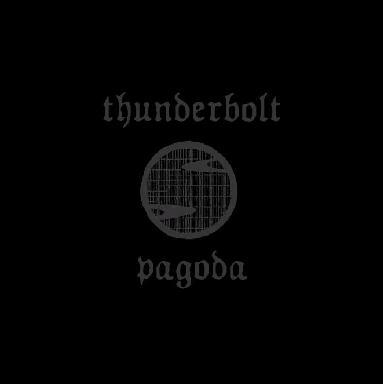 Thunderbolt Pagoda is the latest project from a group of Minneapolis based musicians that have been involved in such bands as Skye Klad, Salamander, The Pins, and others. The band consists of Erik Wivinus on guitars and vocals, Nate Cutlan on drums and percussion, Dave Onnen on bass and electric bouzouki, and Ralph Karsten on analog synthesizers, mellotron, and flute. Side one of the LP opens with "Horizon On Fire". An intense, thunderous, metallic intro leads to a psychedelic jam with melodic eastern flavored guitar, flute, synths and a potent rhythm section that creates a tension laced on-the-edge feel. The band alternates between trippy vocal sections and high energy acid rock explosions, including some volcanic guitar and light mellotron embellishments. Black Sun Ensemble fans would LOVE this. "The Watcher" is next and keeps the energy level high. Though "Horizon On Fire" had vocals, "The Watcher" has more of a song element to it. But it's just as psychedelically volatile, as the verses inevitably lead to luscious acidic meltdowns. All of side two it taken up by "Release the Krakken" Parts 1 & 2. It begins very sparse, with a repetitive, echoed guitar note. Bits of flute, light drones and atmospherics soon join in, and the buildup is very gradual. But right after the 6 minute mark the drums kick in, tipping us off that something is about to happen. And sure enough, the band launch into Rock mode, with a mixture of trippy psychedelia and sonic boom claps. Part 2 returns to calm, with floating ambient guitar, flute and atmospherics. A meditative and spacey sound exploration. But a groove slowly gets going and the band starts to rock out, the pace and volume steadily increasing. This would be perfect soundtrack music for an action packed thriller flick. Its very image inducing and I felt like I was the guy being chased in a Hitchcock movie or something like that. I've been following Erik Wivinus and Dave Onnen's work for many years now and they never disappoint, always being on the more progressive end of the psychedelic spectrum. If you're already familiar with the music of Skye Klad and Salamander you'll know what I mean. Vinyl lovers step this way because this is an LP only release, pressed on 180g vinyl. For more information you can visit the Thunderbolt Pagoda web site at: http://www.myspace.com/thunderboltpagoda. Visit the Mutant Music web site at: http://www.mutantmusic.com.